Over the years, the annual Democracy & Diversity Institute organized by the Transregional Center for Democratic Studies has nurtured a closely knit network of extraordinary alumni coming from all over the world. An essential part of what makes this network strong and living are the amazing encounters and productive collaboration among TCDS alumni after the institutes are over. Such was, for example, the recent encounter between two alumni of Democracy & Diversity Institutes in South Africa, Busisiwe Ntsele and Solongo Wandan. 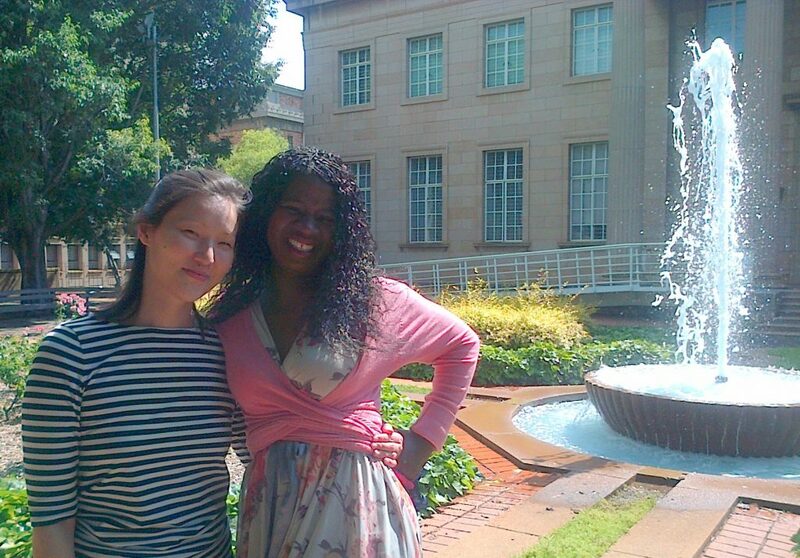 Busi (Joburg 2013) and Solongo (Cape Town 2009) met in Johannesburg a few weeks ago. Solongo, who is working on her dissertation on constitution making in Poland and South Africa, came to WITS University as a visiting scholar in the Political Science Department. Busi, an MA student in International Human Rights Law at WITS, was very kind to introduce Solongo to Johannesburg, making her feel welcome in a city that can be at once breathtakingly beautiful to fall in love with and overwhelmingly complex to understand. On the picture featured below, Busi and Solongo are standing in front of WITS’ William Cullen Library, which became Solongo’s “second home,” as she called it. Busi just successfully finished her final exams, which completed her MA course work at WITS. She is now busy with her Research Report that she plans to submit in February. She is looking forward to the completion of her Master’s and hopes to start her PHD studies soon. We are always happy to hear when the TCDS alumni network gets strengthened by new social and academic ties, so please keep us updated on your transregional encounters & collaboration. In the meantime, good luck to Busi and Solongo with their studies!